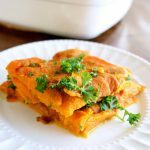 This clean eating layered sweet potato casserole doesn’t look like much, but it’s mighty delicious!! Still struggling to get into the kitchen more often? Wishing it were easier to cook healthier foods more often? Don’t want to give up hours of your precious weekend for food prep? I understand. Bringing time into your life for nourishment is not always the quick thing we hope it will be. Getting into the kitchen on a daily basis is truly difficult for some people. But I’ve found that for many, it’s less a matter of time, and more a matter of knowhow. So many of you have grown up on boxed and packaged foods. If you’ve grown up with microwaved meals, the truth is, it’s going to take some effort on your part to start making sure you have kitchen time, each and every day. And for those of you that do cook, many of you cook the same things over and over again because it’s what you know, and because you know it, it’s the easiest thing to do. So you eat the same thing over and over. But nourishment is meant to include variety. We literally need to “eat the rainbow” to keep or improve our health. At my last doctor visit, my doctor told me that the liver loves orange foods. It thrives off of the nutrients it gets from carrots, sweet potatoes, orange bell peppers and more. So ya, on top of needing to find time to get into the kitchen, you also need to ensure you are getting variety. And including variety means you need knowledge on how to work with different foods. Something that the current generation is sadly growing up without. Recipes like the one here do take a bit of baking time. But the prep time is reasonably short. So if you’re stressing out about actual time in the kitchen, this one is actually pretty simple and basic. You’ll be in and out of the kitchen in 15-20 minutes. When you are trying to adjust to cooking regularly, it’s important to start with basic recipes. Simple ingredients and recipe instructions that aren’t a mile long are key to helping you make that adjustment. So if this is where you’re at, start with the recipes. Take an hour on some evening and print out a bunch of recipes that have super simple ingredients and just a few instructional steps. Because if you can keep the prep time short, the baking time on a recipe like this is no big deal because you can be doing other things while this bakes. I know how it is when you start to get bored in the kitchen. Night after night, it’s chicken and rice, chicken and rice, chicken and rice. Especially if you are looking to keep things simple for both time and your experience level. But you have to branch out just a little from time to time to get comfortable with doing different things in the kitchen. Cooking is one of those things where the more you do it, the easier and faster it gets. So don’t panic if you need more time in the beginning. I promise, it will get better! I’ve already covered all the different ways you can keep things interesting with chicken breasts, but I don’t often move past the brown rice. I mean, it’s easy to make, simple to “dress up” with different things and it’s a healthy option for many people. That being said, rice can get old. And since I’m a big sweet potato fan these days (I didn’t used to be! 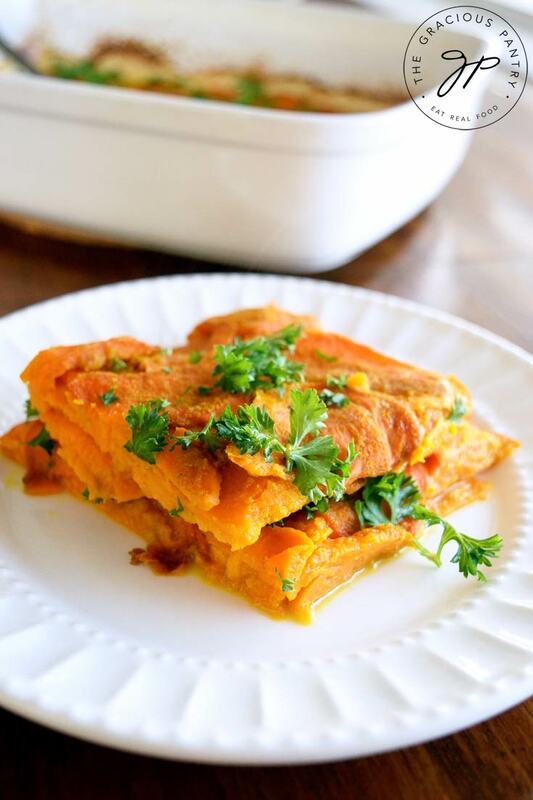 ), I thought I’d take a stab at making this Clean Eating Layered Sweet Potato Casserole. Truth be told, I enjoyed this for a 100% plant-based breakfast! But really, it’s a wonderful side dish for just about anything, chicken in particular. This wonderful side dish is packed with delicious flavor! I personally made this with nutritional yeast and I can honestly say I would have preferred it with parmesan if I was still eating cheese. So I highly suggest that if you do eat parmesan cheese, that you use about a 1/4 cup of that in place of the nutritional yeast. It's good with the NY, but I know it would be far tastier with parmesan. Slice your potatoes as evenly as you can. They don't have to be perfect, but close. Whisk together the almond milk, nutritional yeast, garlic powder, onion powder and ground turmeric. Oil a casserole dish with the oil. Layer the sweet potatoes in the first layer around bottom the casserole dish. Drizzle a small amount of the almond milk mixture over the first layer of sliced potatoes. Add another layer of potatoes, drizzle on a bit more of the liquid and repeat, ending with a top layer of the almond milk mixture. Cover the casserole dish with foil and place in the oven for about 60 minutes (time can vary slightly by oven). When you can easily pierce the potatoes with a knife, they are done. Remove the dish from the oven, remove the foil, sprinkle with parsley if you wish. Season with salt and pepper to taste at serving. Is the oven temp 350?